Designed in the UK, Toyotomi may be a little known brand new here at the moment, however they are one of the best well known household brands in Japan where humidity, condensation and high occupancy living are common everyday problems. 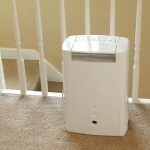 Given the size and scale of the Japanese market, this alone makes taking a closer look at this dehumidifier worthwhile. This unit is brand new to the Amazon market place and as such has not had time to build up a strong review base as of yet, but I’m sure it will. Current online price here. Design and aesthetics are always a personal choice, but for me this has to be one of the most clean and elegant looking dehumidifiers I have seen. And I’ve seen and used a lot. The Dimensions are : Width 32cm : Height 47cm : Depth 21cm , So it will look tidy, modern and unobtrusive wherever you place it. 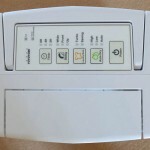 The control panel is similarly clean and very easy to use without being overly complicated, see the User manual here if you wish. Weighing in at only just over 6kg it’s also very portable and one of the lightest in its class. The stated maximum water extraction is 9 Litres per day under ideal circumstances (max speed lots of damp) and the water collection bucket holds 2.2 Litres at a time, which in real terms may mean emptying it twice per day. This makes it ideal for most homes up to 3 bedrooms. There is a continuous drain option available with a connector hidden behind a plastic tab should you need it, but I have never seen anyone connect this up which is why nearly all manufacturers no longer supply a connection hose in the box anymore. For those with larger homes this unit has a bigger brother in the TD-Z110 which is available and I may review this at a later stage just because I was so impressed with this model. Power consumption is on the low side at 350w in slow speed and respectable at 620w on high speed mode, which again I find high speed is hardly ever used once any initial problem is under control. This unit has a humidistat to save money just like many others which stops the potential overdrying of your air as well as saving money. 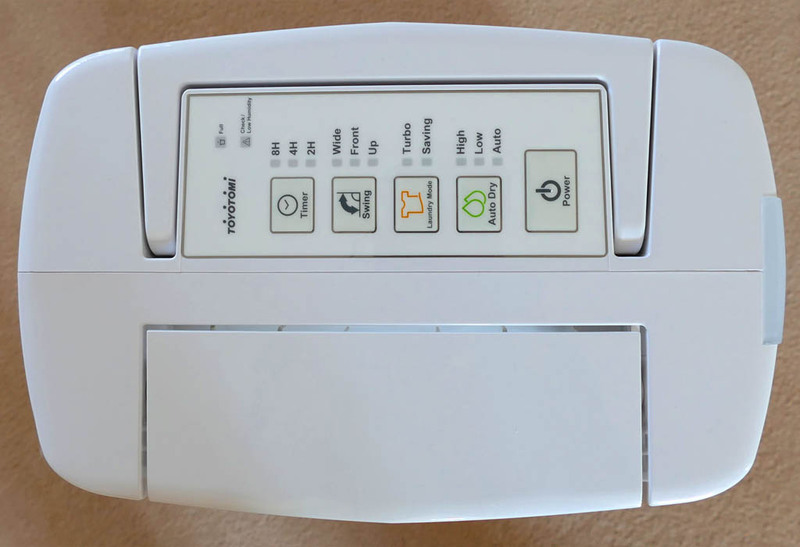 Standby mode is low at only 1w and it has an inbuilt energy saving ‘fuzzy logic’ algorithm within the dehumidifier which will attempt to make further savings when in use, although how on earth you test this I have no idea at all. On paper this sits in the middle of the pack at 47dB. I say on paper, because tested against its best rivals from Ecoair and Meaco rated at 34dB and 44dB respectively, it was noticeably quiet. In fact you can listen for yourself in my video review at 4min 39seconds. I did find a reference somewhere that the slow speed is actually 37bB and the high speed is 47dB which may be true and could explain a lot, however as that is not what is stated in the manual I cannot confirm it. 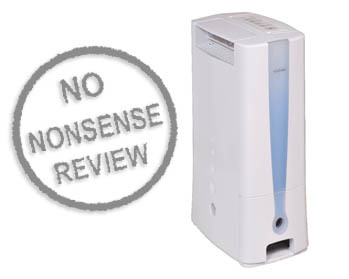 What I would say though is don’t get obsessed by trying to obtain the quietest dehumidifier you can. Although I understand the desire in my experience is if you chase the lowest dB figure you often end up with a small unit that doesn’t work very well. Because this is a desiccant dehumidifier, it has a large effective working temperature range from as little a 1 to 40ºC, so there’s no need to worry if you place this in cool locations. In my tests it managed to extract 320ml or just over half a Pint of moisture from the air in low power mode and 570ml or just over a Pint in high power mode. This is a very respectable figure and similar to its competitors in this popular size class. The front facing exhaust design has little to obstruct the airflow, and 3 automatic moving louvre settings, the laundry drying feature should be very good. The manufacturer claims a 20% increase in drying efficiency over the competition but this could prove hard to test because there are so many variables involved. 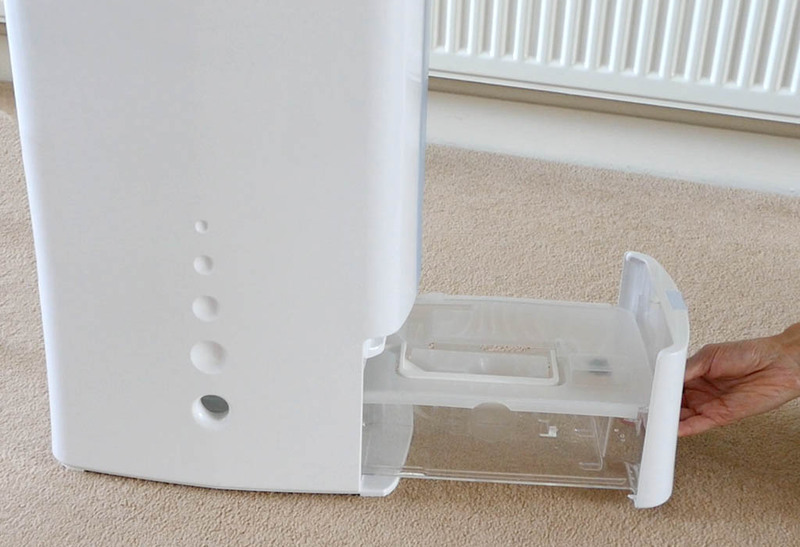 It did have a little left hand bias in terms of air power but this is common in dehumidifiers due to the positioning of internal fans, it can however be compensated for by sliding the fins left or right in the louvre manually with your fingers which was good. 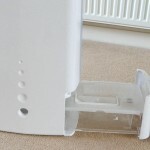 It does come with an easily removed and cleanable antibacterial air filter and the now standard 2 year guarantee which is nice. All desiccant dehumidifiers have a heating element built in, this one however has a programmed cooling cycle that kicks in once every 10 hours, not only is this a clever safety feature but it should increase the longevity of the unit long term. I thought this showed good safety awareness and good engineering practise. 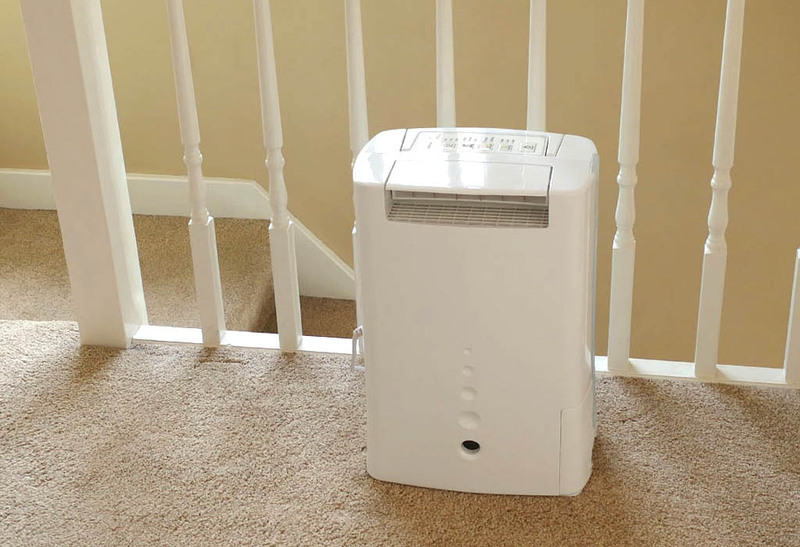 I really liked this dehumidifier, potentially one of the best on balance, ever, so far. The only thing it lacked was an Ioniser function to really tick every box. Having said that it wouldn’t be a deal breaker for me, in fact some people report black marks or ‘spotting’ created on walls by ionisers so I’m indifferent when I see them now. I thought quality was high throughout including the moulding of the case itself. If I could find a negative I thought the price was at the high end (current price here) but like everything in life you get what you pay for.